Pakistani journalist Ahmed Rashid ponders whether the capture of Osama Bin Laden could heap further problems on Pakistan's President Musharraf. 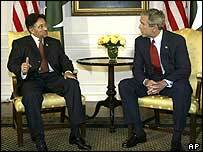 Musharraf and Bush - equally keen to see Bin Laden captured? The early capture of Osama Bin Laden and Taleban leader Mullah Mohammed Omar would provide an enormous boost to President George W Bush as he sets out to win re-election in November. That is the view I was hearing from US officials in Washington during a recent lecture tour of the US - and it's a view shared by US officials in Islamabad. So President Musharraf is facing intense pressure from Washington to help US forces in Afghanistan to capture or kill Bin Laden and other top al-Qaeda and Taleban leaders hiding in the Pakistan-Afghanistan border tribal region. However, Pakistan's increased military role in the volatile tribal belt poses enormous political and military risks for General Musharraf. In mid-March and at the end of February troops and paramilitary forces launched major operations in South Waziristan, a tribal agency in the Federally Administered Tribal Areas (FATA) between Pakistan's North West Frontier Province and the Afghan border. These were the latest moves by the army into FATA where the local Pashtun tribes have enjoyed considerable autonomy since the British Raj. With a population of 5.8 million, the seven tribal agencies in FATA, all inhabited by the Pashtuns, were created by the British to serve as a buffer between Afghanistan and British India. Dozens of US intelligence officers are now believed to be working with the Pakistan army in the FATA. The government in Islamabad firmly denies such reports, saying it will not allow US troops to enter Pakistani territory. According to the US army in Kabul, increased co-operation by Pakistan would create a "hammer and anvil approach" with Pakistani forces being used to push militants into Afghanistan, where US troops would be waiting for them. That, however, is easier said than done. There has been fierce resistance by tribal leaders who have repeatedly fired rockets and shells at forward posts of the Frontier Corps along the Afghan border and also attacked the main army base in Wana, the headquarters of South Waziristan. The anger of the tribesmen escalated enormously when nervous Pakistani troops fired upon a truck after it failed to stop in late February. Eleven passengers were killed. Local politicians say the political tension in the FATA is explosive. Anti-government sentiment is rising despite government money being spent on social and economic development projects and sympathy for the militants is increasing rather than decreasing. The Pakistani military is nervous of conducting such operations when there is already substantial political unrest in the country. The army is already taking a beating from opposition political parties for placing all the blame on the country's nuclear scientists over the recent revelations of the proliferation of nuclear technology, while whitewashing the army's own possible role in the affair. The military also fears that if it helps US forces capture Osama Bin Laden, its usefulness to the Bush administration may then dissipate. That would allow Washington to step up pressure on Pakistan to open up its nuclear weapons programme for inspection by the US and the International Atomic Energy Agency. Moreover, if Bin Laden is captured or killed, there could be severe repercussions for President Musharraf. These could include violent protests by Islamic parties and revenge suicide attacks by al-Qaeda and its sympathisers, as well as further attempts to assassinate President Musharraf who survived two attempts on his life in December. Other problems for General Musharraf are mounting. There has been a rise in Sunni-Shia sectarian killings, with more than 40 people being killed in Quetta during the Shia festival of Ashura on 2 March. More than 150 people were wounded as suicide bombers and gunmen belonging to Sunni extremist groups attacked a Shia procession. Meanwhile, the political fallout of the stepped-up operations in the FATA could be severe. 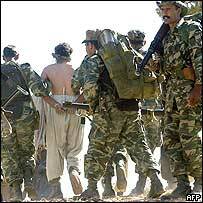 The provincial governments of North West Frontier Province and Baluchistan are under the control of Islamic fundamentalist parties who are deeply offended by the army operations and are openly sympathetic to the resurgent Taleban movement in Afghanistan. Pakistan is also under US pressure to curb Taleban recruitment and other activities in Quetta and smaller towns in Baluchistan, where they are based and receive open support from ruling Islamic parties such as the Jamiat-e-Ullema Islam. The most dangerous fallout would occur if US forces in Afghanistan were to cross into Pakistani territory to carry out hot pursuit of militants - permission for which has been given to them by the US military at the end of last year, according to US officials. Despite non-stop government denials, the border region is already awash with rumours that US troops will directly enter the FATA - such a move though, is highly unlikely. The government has made it difficult for outsiders to travel in the FATA, so it's hard for aid workers or journalists to see the situation for themselves. That has only fuelled the rumour mills and undermines government statements which are seen as one-sided. Many believe the restrictions are in place because US troops are already operating there - although that is unlikely. Either way, whether Bin Laden is captured or not, there will be serious consequences for Pakistan's domestic peace and stability. If you would like to send a comment about this story, use the form below this selection of comments. 1. The struggle between conservative and moderate Muslim factions in Pakistan is the root of current domestic unrest. Activities by either the US or Pakistani military against Mr. Bin Laden (or the Taleban) would naturally exasperate national tensions, but it is unfair to claim these issues are the root source. 2. It seems unclear to infer the removal of Mr. Bin Laden and the Taleban from Pakistan would not be in the best interests of the average Pakistani. Many moderates there believe their own country would have had to oppose the expansion of the Taleban on Pakistani soil, if the US had not first done so in Afghanistan. 3. I agree all the events you relate in your story present a clear and present danger personally to Mr. Musharraf and politically to his administration. It is unfair to suggest the removal of these issues would result in a satisfactory long-term political solution. What rubbish! Al qaeda has launched terrorist attacks inside Pakistan and people are smart enough to distinguish between terrorists and freedom fighters. The capture of OBL and Zawahiri will greatly increase the international stature of Pakistan and go a long way to ending the menace of terrorism inside Pakistan. The MMA and others are not fools to be opposing the capture of killers like OBL or the Taliban. I am very disappointed by Mr Rashid's article. It is in the best tradition of New York Times sensationalism. Such an awkward situation would have been easily avoided if President GW Bush had committed enough troops to rooting out the Taliban and al-Qaida at the beginning of the operations in Afghanistan. He pursued the whole effort with amazing half-heartedness, focusing almost exclusively on Iraq. Now that he sees elections are close and things in Iraq are not as good as they could be, he feels he has to pull out a trump card before November--the capture of some important figures on US's blacklist of wanted dead or alive. It remains to be seen how successful there new efforts will be. As you said, quite a lot depends on it politically--both for President Musharraf and George W Bush. Everyone in the US, not just President Bush, is committed to the elimination of Al Queada and Osama Ben Laden. Indeed, Europe, Russia, China, India and Iran share an equal vested interest in this outcome. Mr. Rashid's fears of a backlash, however, are exaggerated. General Musharraf made a sharp U- Turn when he abandoned the Taliban abruptly, yet no popular revolution erupted! The Al Queada - Taliban brand of Islam is not indigenous to Pakistan - and definitely not to the Baluchi-Pushtoo areas, which were the bastions of the enlightened Islam of Gaffar Khan and Samad Khan. The brutal suppression of these progressive forces gave a free rein to foreign extremists. Genuine democracy in Pakistan, especially in the Pushtu-Baluchi areas, is the best assurance for General Musharraf against this international brigade of assassins. It would also set Pakistan on the road to progress and prosperity. Once you hold a tiger's tail, you can neither leave it nor hold on to it! I think that we are really close to getting osama but i think it could start some more problems for us. Like Al-Qaeda might attack us even if we do get him. 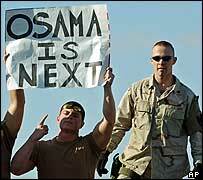 It seems clear that Osama will be captured just in time to reassure George Bush of re-election. This is the Bush family machine in full operation - making americans sacrifice lives and family to further the Bush family ambitions. As hard as it is to believe, Bin Laden is a hero in Pakistan. He is seen as upholding the honor and way-of-life of Muslims in the face of a U.S. ruled world that is bent on destroying traditionl Islam. His capture or death in Pakistan will all most certainly spark a rebellion in the North West tribal areas, Peshewar and quite possibly lead to riots in Karachi. It's not inconceiveable that Pres. Musharaf will be overthrown and a new Islamist head of state will take the reigns of nuclear armed Pakistan. I hope we've thought this through. The price of victory could be quite high. Pakistan/USA should deal with the monster they created long back. Now it is out of control. Best example of super power short-sighted. Sooner they contain the monster, better for the world. After all who created Mujahedeen? Who armed the the Jehaids? Who created Bin-Laden? It seems that US has understood the pakistan's design of lingering the capture of bin laden and keep the US support as long as possible. US need to understand that it will loose his all allies like spain, if he does not root out all terrorist infrastructure from pakistan by putting immense pressure diplomatically or militarily. Pakistan is still hotbed of islamic terrorism causing problems to Afganistan and India. I would just say that if US ditched Pakistan after catching Osama, then I think US does not know Musharraf well. When he can take a U-turn in 2001, then he can do it again. He can do anything for Pakistan. Pakistan's foreign policy should be transparent to its people and serve the best interest of the land and its people and not to please Washington which has historically turned its back to Pakistan once their objective was achieved. Pakistan should continue to achieve peace with all its neighbours so that its people could get a fair share of education, technology and quality of life. I respectfully disagree with Mr. Rashid on his dire assessment of the projected backlash in pakistan due to President Musharraf's efforts to rid FATA of terrorist elements. On the contrary, most Pakistani's support his strong resolve to end religious and sectarian terrorism in pakistan and to incorporate these backward areas into main stream Pakistan. We salute Pres. Musharraf's visionary leadership. There is no doubt that capturing Osama is the trophy of trophies for the Bush administration - particularly at a time when he faces losing one of his strongest coalition partners -, but the result of his capture would surely linger on all of our heads. I believe that the strongest militant elements of Islam would be enflamed by the capture of Osama, and that his capture would subsequently lead to more attacks, such as the most recent in Madrid. 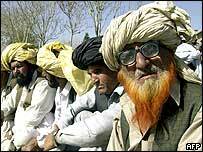 It is also clear that Musharaaf is in a tight squeeze between the US and tribal elements in FATA regions. The possibility remains that the anvil and hammer may come crashing down on Musharaaf, ending the life of another short-lived coalition partner. I am pretty sure YOU Brits never put any message from India on your Have your say for whatever reason (i write a message everyday for any of the discussions! ), i have lost my respect for the BBC. I think Musharraf has gone one step too far in appeasing his political overlords. There is already a deep-rooted resentment against the governments, past and present, for their lack of efforts to develop the region. The Bangladesh scenario may repeat itself, if the Punjabi elite does not stop exploiting the people and the resources of these regions, which have been kept intentionally under-developed. The people feel just as betrayed by the religious parties that have taken office, since they failed to bring about any significant change, other than acting as a gratuitous thought police. The time is rife for a people's revolution against 57 years of exploitation. As usual Ahmed Rashid describes and sums up the situation very well. Leaving aside Musharaff's difficult challange to balance national and international factions and to keep a long term base of support more effort should be put find ways to develop the economic base and prospects for Baluchistan and the North West Frontier Province in order to win the hearts and minds of people there. This will also have positive effects on Afghanistan reducing support for the insurgent Taliban. The problem is not whether Pakistan would capture Osama Bin Laden, but the ambiguity the Americans continue to display. There is nothing the Americans are doing to show that they will be there for the longer term (no MFN status, no FTA, etc...). A start would be to approach Pakistan on an equal basis as with India with regards to security. Pakistan is a nuclear power, I do not believe that anything will be able to change that, be it any successive Pakistani government or external (forceful) influence. If the Americans ever have any hope of security in this region, it will through a balanced approach. And yes Mr. Ahmed Rashid is right when he says, the outcome will be dire if Osama is caught anywhere, be it Afghanistan or Pakistan. That'll be the test of any strategic relationship the Americans have struck with Pakistanis, not a gun to the head to give up its very security thats has been protecting it from harm by a hostile neighbour. Friends are indeed friends when they understand each other, they consult and ask. Not deliver consequences!! The US has always been the worst ally for Pakistan in the last 50 years always ditching Pakistan when their need is over. So now Musharraf should be careful in helping US out. As far as the US-India allinace is concerned, Pakistan should not be worried since the US will ditch India once they realize that India can never counter China. India might be growing but their per capita GDP is the poorest in the world. Majority of their population lives in slums and their minorities are treated worse than the lowest class hindus i.e the untouchables. Ahmed Rashid knows that the army of pakistan has ruled pakistan directly so many years and the democratic process was outlawed by the army generals. Only pakistan can be saved by politicians alone even though we know politicians have been called corrupt and selfish and they never tried their best to solve the path of democracy in pakistan. The role and rule of the pakistan army has been very damaging for the national development of pakistan and General Mushraf is like other Bad - army generals in pakistan who continue to hold power in "to save pakistan from fundamentalism". Pakistan will remain in danger if pakistanis will never get rid of the role of the pakistan army from politics and its patriotic - false slogans. Disclaimer: The BBC may edit your comments and cannot guarantee that all e-mails will be published.